Now, I certainly can't claim that we are anything even approaching experts on Banh Mi. 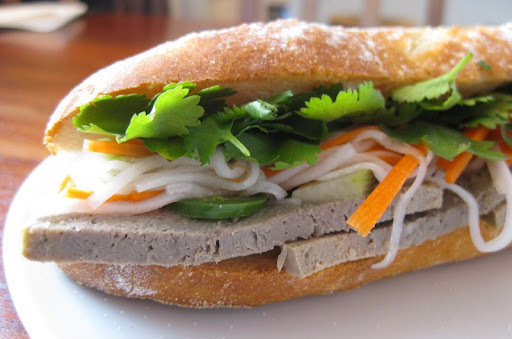 Quite the contrary - we are relatively recent converts to the Church of the Vietnamese Sandwich. 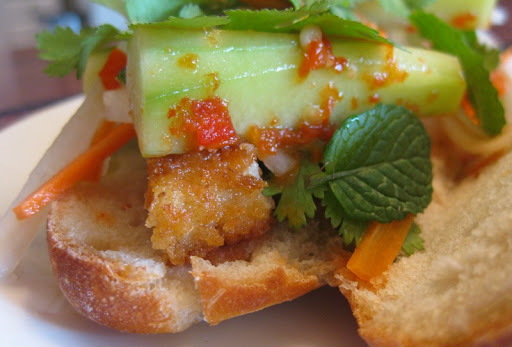 What I can say, however, is that we've been making, eating and enjoying Banh Mi a lot lately. And you should, too. Banh Mi starts with good bread. Luckily, our Banh Mi obsession has coincided with Sherry getting more into bread making. 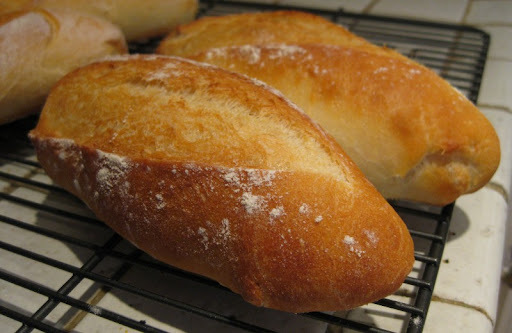 We've tried a number of baguette recipes, some more complex than others, and have been happiest with the simplest - I love it when that happens! Her recipe uses chicken livers, ground pork, ground beef, eggs and some extra pork fat. 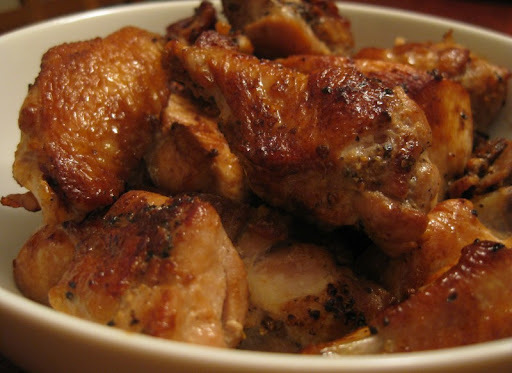 It sets up quite firm and slice-able, and is flavored with an aromatic mixture of onion, garlic, salt, pepper, Cognac and Chinese five-spice powder. 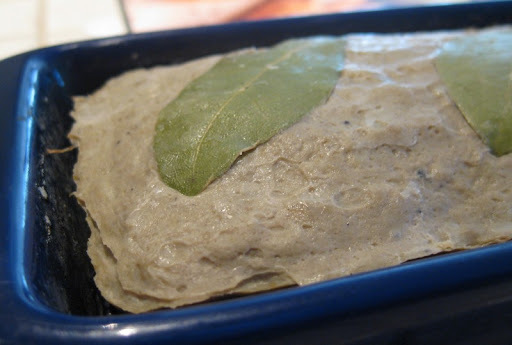 No need to make your own pâté, though - your favorite store-bought variety will do just fine. 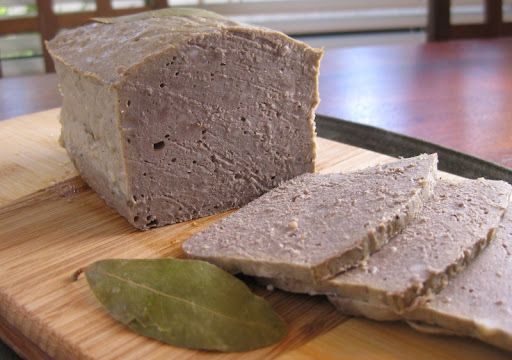 We really like using a humble liverwurst. Next up, what I think is the most important component of Banh Mi - the pickled vegetables. 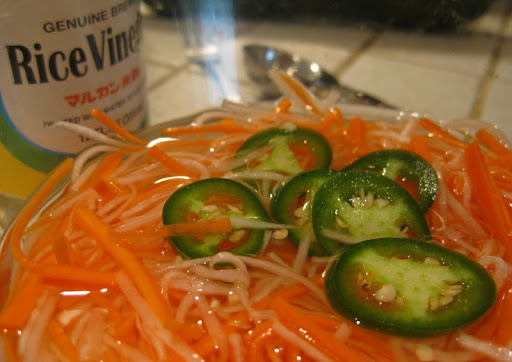 We do a quick-pickle of carrot, daikon radish and cucumber with a bit a jalapeño for some kick. Start with the meat on the bottom, top with the tangy marinated vegetables, add a generous amount of cilantro and mint, and you're good to go. 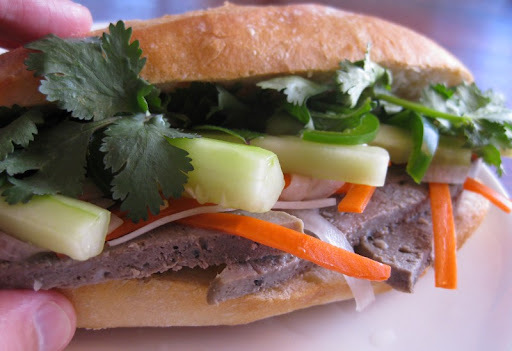 So, if you haven't made your own Banh Mi before, we definitely encourage you to give it a try. Cut the carrot and daikon into 2-inch lengths. Julianne each (matchstick or thinner) and place into a bowl. Sprinkle with salt. Using your hand, massage the salt throughout the vegetables. Let sit for 5 or 10 minutes, at which point a piece of carrot should bend in half without breaking. Add the sugar to the rice wine vinegar and stir until completely dissolved. Thoroughly rinse and drain the carrot and daikon. 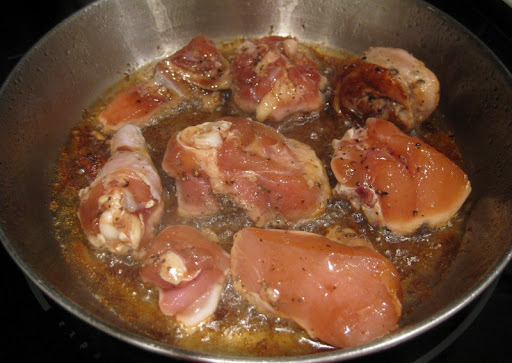 Return them to the bowl and cover with the vinegar-sugar marinade. Let sit at room temperature about an hour. Meanwhile, cut the cucumber into 1/4-inch sticks (discard the seedy center). Cut about half of the jalapeño into thin slices. 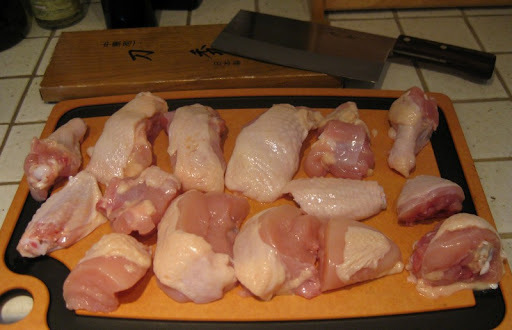 Taste to assess the heat level - if very hot, cut the slices in half. Add the cucumber and jalapeño slices to the carrot-daikon mixture for the last 30 minutes. To use, grab a generous pinch of vegetables and gently shake, but do not drain. 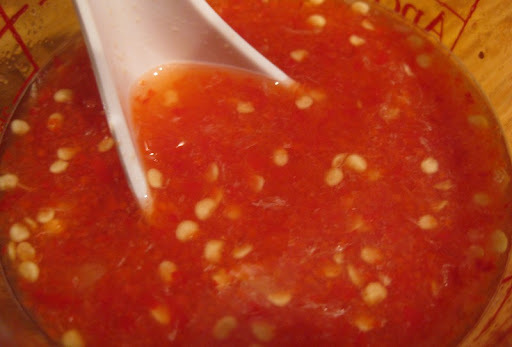 Use as a condiment or garnish. Makes enough for about four 6-inch Banh Mi. 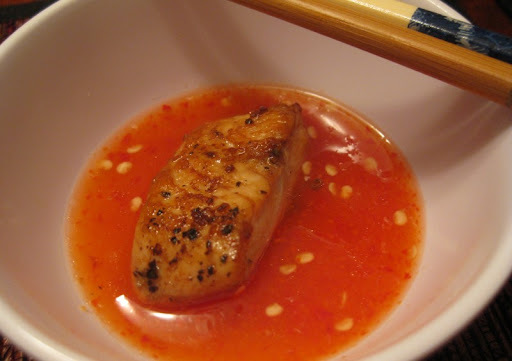 Extra carrot and daikon can be stored with the marinade in the refrigerator for up to 3 weeks (discard extra cucumber or jalapeño). 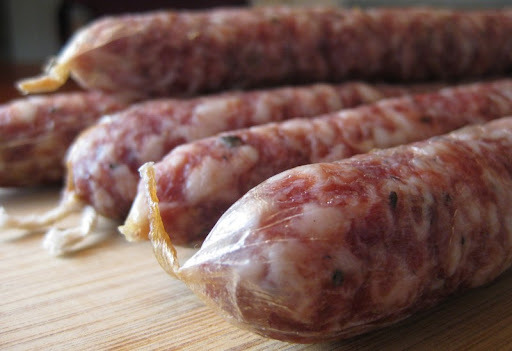 Saucisson Sec is pretty much the easiest cured sausage you can make - in fact it just means "dry sausage" in French. The meat is pork, unadulterated save for some salt, pepper, sugar, garlic and "curing salt #2". 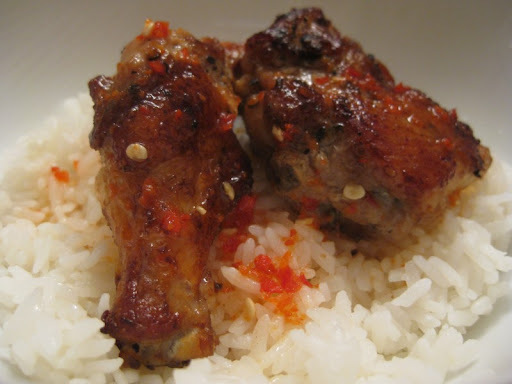 While it may be sparse in ingredients, it is big on flavor. Pure pork goodness. 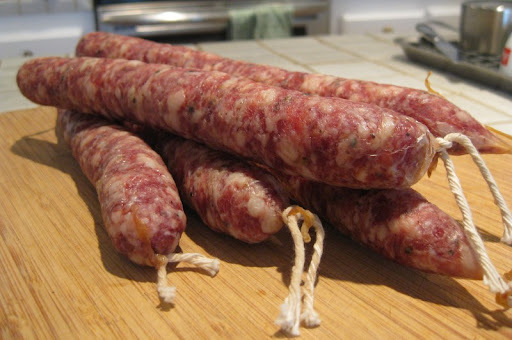 It cures quickly - about three weeks in our meat curing fridge. We've made it twice so far, and given how simple it is to make, we will likely keep it in regular rotation going forward. Writing this is making me hungry. 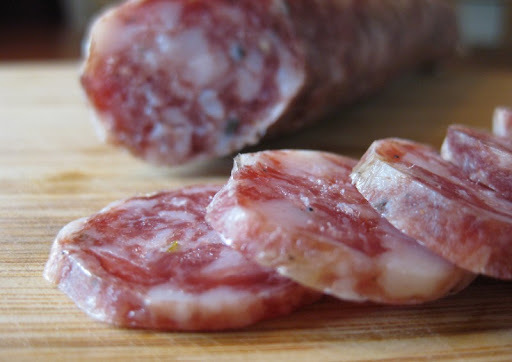 I think I'll go grab a few crackers, slice up some Saucisson, and have myself a little snack. I go to the beach nearly every Saturday morning - not for surfing or sunbathing, but for outdoor grocery shopping. 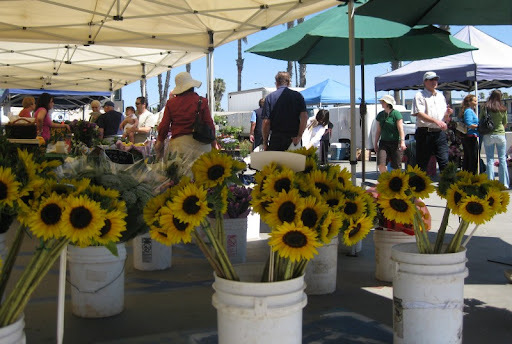 The PB Farmers Market is one of San Diego's smaller markets, offering only direct farmer-grown products - there are none of the street-fair style prepared-food stands or arts-and-crafts booths. I love the fact that every vendor is a local farmer (or farmer's kid!) selling only what they grow - it's all fresh and top-quality, and the selection is getting better all the time. I always start at the South end of the market where most of the heavy things are located - they go into the bottom of my bags. 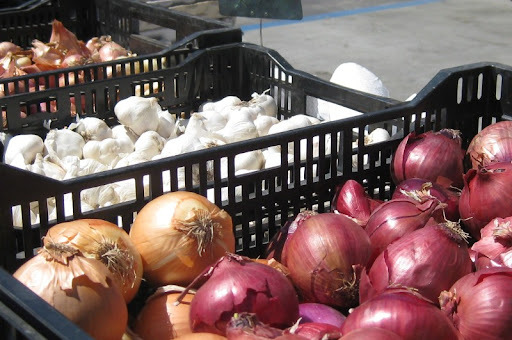 My first stop is Schaner Family Farms from Valley Center for onions, garlic, shallots. This winter we also enjoyed their super sweet Tangellos, a cross between a mandarin tangerine and pomello grapefruit (affectionately dubbed "franken-fruit" by Mike). 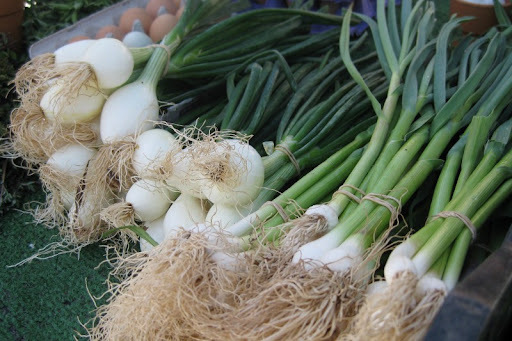 Now in early May we're getting beautiful spring onions and green garlic. Next stop is Polito Family Farms (also from Valley Center) for big bags of Valencia or Navel oranges and huge Oro Blanco grapefruit. 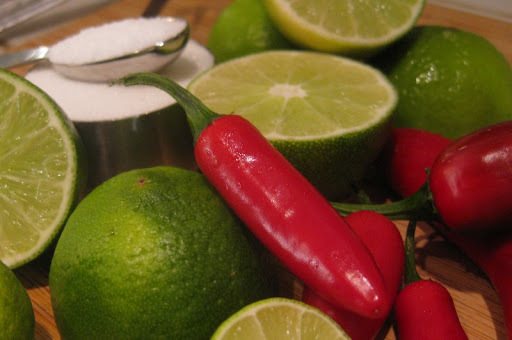 Depending upon the season I get all kinds of lemons, limes, tangerines and avocados here as well. France is usually running the stand and she always has a young man helping her out - in this case, her son. 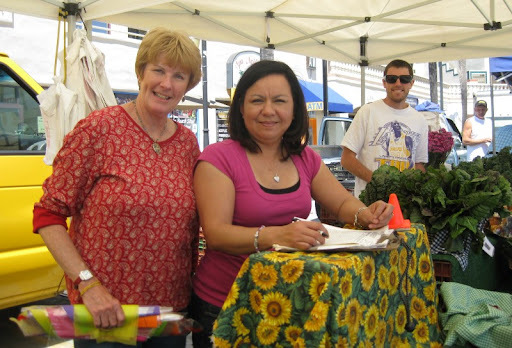 A fairly new addition to PB's Farmers Market is the Hopkins AG table. 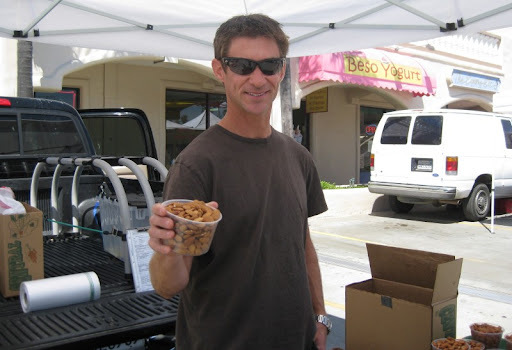 Darrin sells raw and freshly roasted and seasoned almonds from his grandfather's almond and cherry tree farm up in Bakersfield. 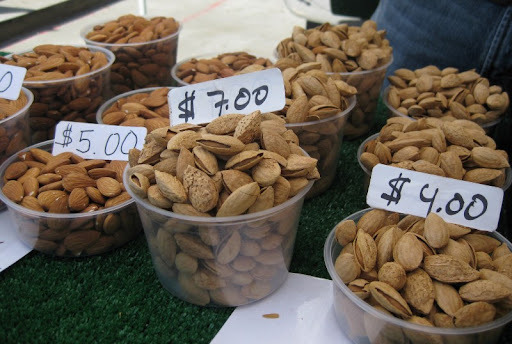 Our absolute favorite are the fresh, raw, in-shell almonds. Tasty snacking, but since it takes time to crack open the shells they don't disappear by the handful the way the others do - much safer for the waistline! Cherry season started last week, and our first batch was great. At the table next door I purchase my weekly supply of lovely, red tomatoes, grown on a farm near Carlsbad. 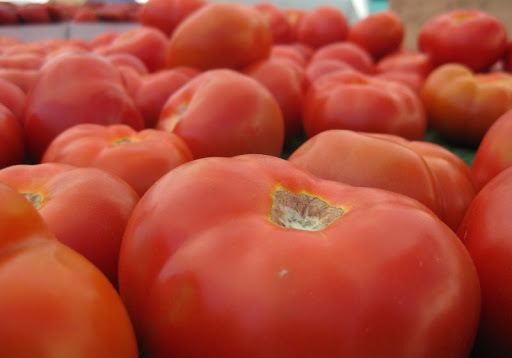 These tomatoes have been tasty the entire year - even in the winter months. 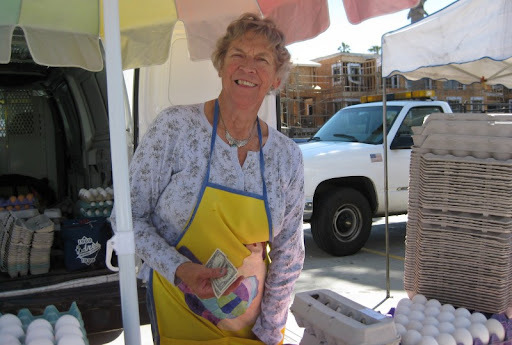 Every week, rain or shine, Annie (aka "the Ramona Egg-Lady") sells local, farm-fresh eggs from her family's Eben-Haezer Egg Ranch in Ramona. I always get a dozen large, free-range browns. The PB Market is split into two sections. Crossing over to the Northern half, the focus shifts to flowers and fresh vegetables. One of my favorite stops is the Maciel Family Farm stand manned each week by Sue and Laura with occasional help from a young man. 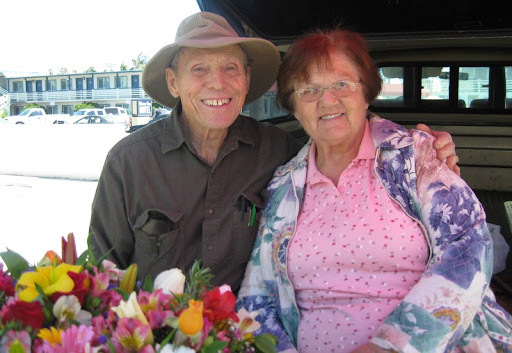 Laura and her husband, Adam (who is at a market in Temecula on Saturdays) grow a huge and varied assortment of vegetables and flowers up in Bonsall. The selection changes frequently, but I can always count on greens like romaine and red leaf lettuce, swiss chard, mustard greens, collard greens, spinach and kale. Often there are beets, turnips, kohlrabi, radishes, chives, lemons, tomatoes and fresh herbs like tarragon, parsley and cilantro. 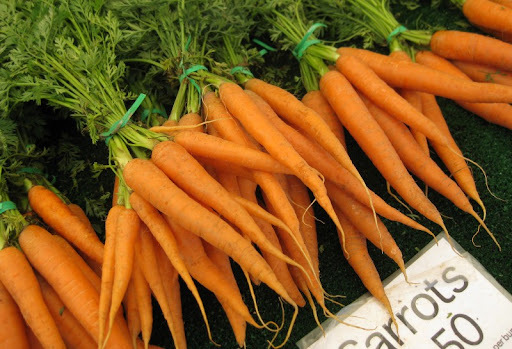 Right now they have the sweetest, most flavorful carrots I've had in ages. 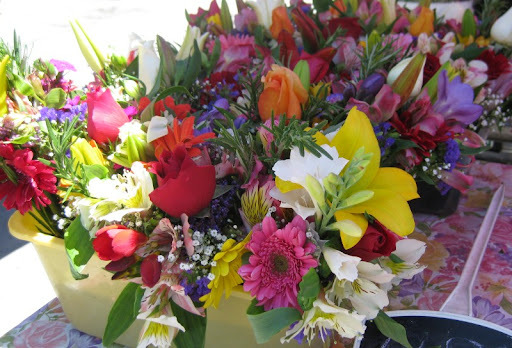 In addition to large mixed bouquets, roses, and seasonal bunches of lilies, freesia, tulips, and gerbera daisies, Lois and George sell beautiful little bouquets of mixed posies. I like to keep one by my kitchen sink at home. 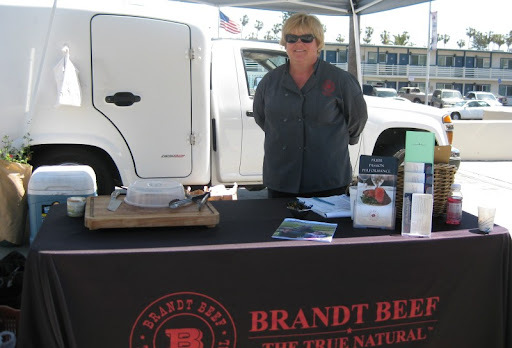 Right next door, Brandt Beef parks their refrigerated truck. We've been enjoying their meats since they first set up shop in our market just over a year ago (you can find posts of ours using their products here: New York Strip, Bavette Steak, Tri-Tip and, of course, burgers) . If you time it right, you can often sample a freshly grilled piece of steak or burger - I was too late this time. 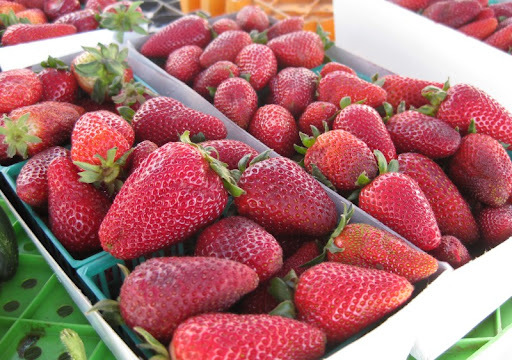 Several stands sell strawberries, but I've been buying mine from the same two guys since January, when the berries were a bit "crispy" but loaded with great flavor. Now, later in the season, they really can't be beat. 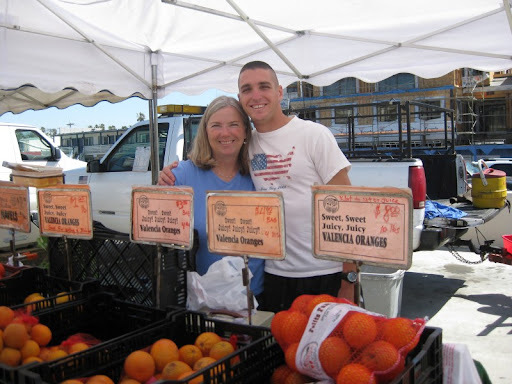 Located right next to the Maciel farm stand, these two guys (who don't really pose for pictures) bring their strawberries, blueberries and vegetables from their farm up in Oceanside. I've been really pleased that this stand carries things like cauliflower, broccoli, snow peas, artichokes and bell peppers. I'm looking forward to corn season, too. Finally, my last stop of the morning is here at the potted-plant stand. 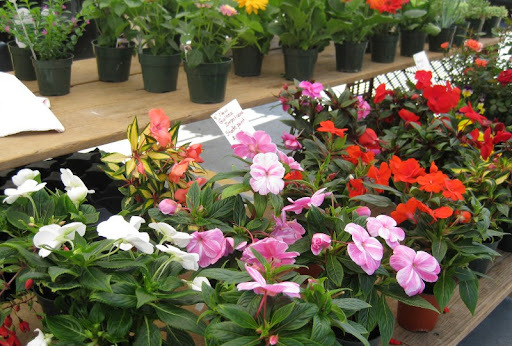 There are gorgeous hanging plants and lots of potted flowers of various types. The grower is a super friendly fellow. Over the years, I've purchased several pots of herbs now growing on my patio - rosemary, thyme, sage, marjoram, oregano, basil, mint and tarragon. 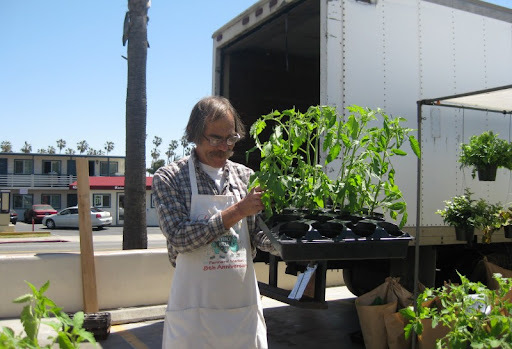 During the winter holidays he sells an assortment of poinsettias, while currently he's got chile pepper and tomato seedlings. 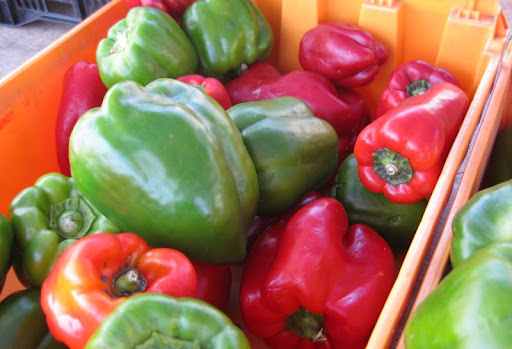 There are a few items carried by multiple growers at the PB Farmers Market, but generally speaking each one fills a specific niche allowing me to do a significant proportion of my grocery shopping on Saturdays at the beach. 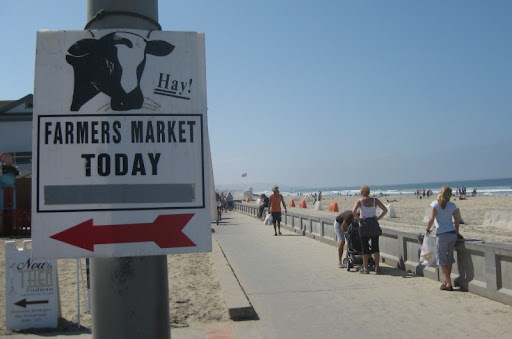 Surf, sun, sand and a really good farmers' market - I'm happy.